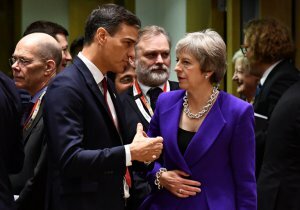 Spain’s Prime Minister Pedro Sánchez said Friday that his government is preparing emergency measures to preserve the rights of Britons in Spain in the event of a no-deal Brexit. ‘I want to sent a message of calm to Spaniards who live in Britain and also to Britons who live in Spain: their rights will be maintained whatever the scenario,’ Sánchez told a year-end news conference following a weekly cabinet meeting. The government will adopt measures by a decree-law which will be presented at the beginning of February ‘at the latest’ that will ensure Britons would keep their rights even if Britain leaves the EU without a deal as long as Spaniards get the same treatment in Britain, he added. The measures, which have been drawn up in ‘close cooperation’ with Brussels and other EU member states, will also protect bilateral trade ties, the prime minister added. Earlier this month top-selling Spanish daily El Pais, citing anonymous diplomatic sources, reported that Madrid and London were finalising a bilateral agreement that would give British residents in Spain and Spanish residents in Britain the right to stand and vote in local elections in the country they live in after Brexit. There are dozens of locally elected British town and city councillors in Spain, mostly along the country’s southern coast. Officially, over 300,000 Britons reside in Spain, but many do not bother to register, with estimates suggesting between 800,000 to a million live in the country. Around 115,000 Spaniards are registered as living in Britain. Britain is the biggest destination for Spanish investment abroad and is Spain’s main source of foreign visitors. Spanish banks such as Santander play leading roles in British finance while Spanish service providers like Telefonica and construction firm FCC have significant holdings in the country. British Prime Minster Theresa May secured an agreement with European Union leaders on 25 November that would see Britain leave the bloc on 29 March with continued close trade ties, but the odds look stacked against her getting it through a deeply divided British parliament. The deal has been criticised from among May’s Conservative lawmakers by supporters of a cleaner break with the EU and those who want to keep closer ties.